High-resolution aerial photographs taken by professor Kim Reece of the Virginia Institute of Marine Science show the broad extent of the algal blooms or “red tides” currently discoloring lower Chesapeake Bay. 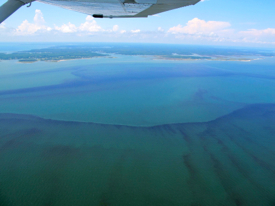 The photos, taken as part of a July 31 reconnaissance and monitoring mission flown by Sid Adams of the Virginia Marine Resources Commission, show that the blooms extend throughout the waters of Hampton Roads, up the middle of Chesapeake Bay at least as far north as the Rappahannock River, and along the bayside Eastern shore as far north as Nassawadox. Water sampling shows the bloom extends up the James River at least as far as its confluence with the Warwick River and as far south as the vicinity of the Hampton Roads Bridge Tunnel. 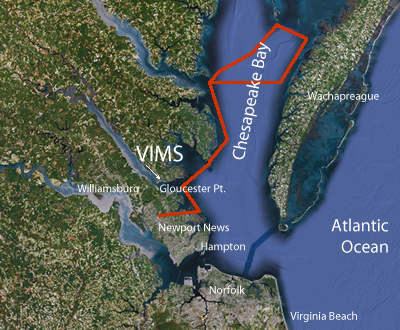 VIMS and VMRC are partners in Virginia’s Harmful Algal Bloom Task Force, a multi-agency body tasked with monitoring and responding to any harmful algal blooms that occur in Virginia. 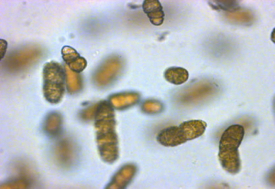 The taskforce also includes officials from the Virginia Department of Health, the Department of Environmental Quality, and Old Dominion University. There is currently no evidence of harm from the blooms imaged during the flight, which are also clearly visible from boats and shorelines throughout the lower Bay. “Red tides” occur in Chesapeake Bay every summer, but have appeared earlier and across a wider area than in years past, likely due to last winter’s warmth and this summer’s heat. Reece says the aerial reconnaissance “allowed us to observe the extent of the blooms” and to “confirm the reports we received yesterday from the bayside Eastern Shore regarding the blooms there.” She describes the blooms as both “extremely widespread” and “very impressive.” Reece and colleagues have been monitoring the blooms during the last several weeks. High-resolution versions of selected aerial images are available on the VIMS Flickr page.